Explore the largest national park in zimbabwe with big five game. We do day trips are everyday of the week from victoria falls Read more.. The victoria falls resort town is desrted by different types of activities and tours with luxury accommodation, camping, lodges, hotels, backpackers, hostels Read More..
Chobe National Park is home to the worlds' largest elephant population, scores of other large herbivores, amazing birdlife, and Africa's largest predators: Read more..
A'Zambezi River Lodge is located in Victoria Falls, Zimbabwe 25km from the airport, nestling on the banks of the mighty Zambezi river within the periphery of the Zambezi National Park. The imaginative architecture with its sweeping curve of grass thatch blends well with the lash green lawns. Azambezi is the perfect retreat to relax and unwind in the quiet ambience of the African wild life and nature, whilst enjoying renowned services. The A’Zambezi is the only hotel with a river frontage and jetty site in Victoria Falls. 83 well appointed and air conditioned rooms including 2 suites, 46 twin rooms, 11 family,17 triple and 7 double rooms. nonsmoking rooms available. Majority of the rooms have balconies facing the river and swimming pool whilst the rest face the National Park and the gardens. world wonder & world's famous elephant park. Enjoy these two major tourist destinations in southern Africa. Its a holiday package that gives you the opportunity to experience activities in Vic falls and game viewing in Chobe national Park. Victoria falls regarded one of the seven wonders of the world. Chobe national park one of the best parks to view animals from the boat and large groups of elephants . This trip features Victoria falls and the largest national park of Zimbabwe (Hwange National Park). Victoria falls is one of the seven natural wonders of the world. It features a lot of adventure activities that you can partake while staying in Victoria falls. It is one of the mail highlight in African holidays. For the big five game lovers Hwange is waiting for you to explore her. Its one of the best parks in Africa with vast of animals and variety bird species. The Okavango Delta is one of the world’s largest inland water systems. It's headwaters start in Angola’s western highlands, with numerous tributaries joining to form the Cubango river, which then flows through Namibia (called the Kavango) and finally enters Botswana, where it is then called the Okavango. Millions of years ago the Okavango river use to flow into a large inland lake called Lake Makgadikgadi (now Makgadikgadi Pans). Leopard Rock Hotel is one of Zimbabwe’s legendary and most well-known Read more.. 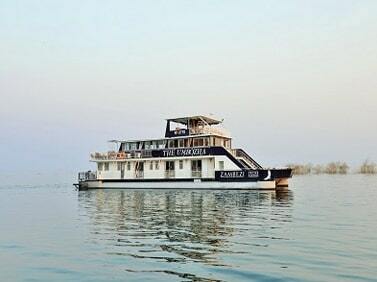 The Great Zimbabwe Ruins (sometimes just called Great Zimbabwe) Read more..
Matopos attraction is well known by its rock outcrop, rhinos, world"s view Read more..
Lake Kariba Houseboat Safaris are a fantastic way to experience the wilderness.Read more.. Located in voctoria falls, Zimbabwe . Copyright © 2015. Africa Zim Travel & Tours All rights reserved.